Join Children’s Home Society and Ms. Nichole from the Eastmont Branch for a fun-filled story time. The hour will include read-aloud’s, songs, and time for free play! Perfect for children ages 1-4 and their adults. Every First Tuesday of the month from 1:00 p.m. – 2:00 p.m. Click the link here to RSVP! Reading Partners is having their annual Gala. 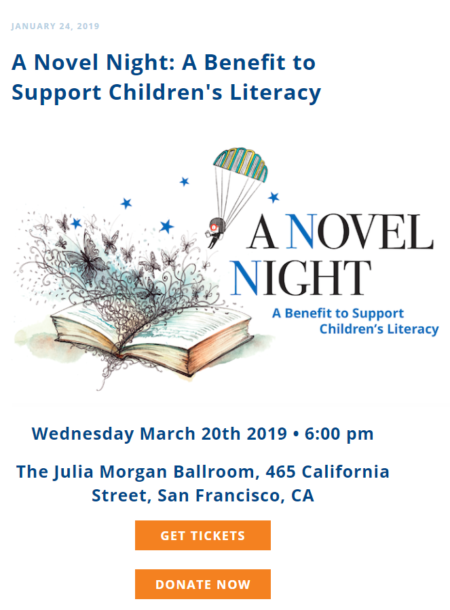 Join them for an evening of literary fun – books, cocktails, food and friends at their annual spring soirée, a benefit for Reading Partners San Francisco Bay Area. The funds raised through the event sponsors and guests will help Reading Partners serve 1,550 readers this school year. Event date: Wednesday, March 20th 2019 at 6:00 p.m.
Our featured guest readers are volunteers from the Sigma Iota (Oakland) Chapter of Omega Psi Phi Fraternity, Inc. Featured books are from African American authors and/or illustrators. Join us at the Eastmont Branch in the Children’s Area on Monday, February 25, 2019 – 5:00pm – 6:30pm. For more events to celebrate Black History Month with the Oakland Public Library visit their website. Attention, kids! Have you written a book for readers age 10 and under? Are you interested in sharing it with friends and families? The Turn the Page! Book Festival at Children’s Fairyland is seeking young writers in second grade and above for our second annual Young Writers Contest! Participate and share your book with Fairyland families and friends at Turn the Page! on Saturday, May 18. Share your work in a place full of inspiration, creativity, and kid empowerment. Connect with local children’s authors and illustrators. Deadline to submit your entry: Friday, April 5, 2019. BANANAS invites you to our free playgroups where you meet other caregivers while children laugh, explore, pretend, play, and create art. Our playgroups welcome grandparents, aunts, uncles, neighbors, friends, parents, and family child care providers. Bring your children for a fun morning and you will explore how play can inspire meaningful learning. Playgroups are hosted in multiple locations across Oakland this Winter and Spring and are for children ages 2-5. Click here to register for your nearest play group. Want to Share an Announcement? Are you part of the Member Network and interested in sharing your event with Oakland Literacy Coalition’s vast network of educators, volunteers and leaders in Oakland and throughout the Bay Area? Organizations in our Member Network can now submit content to be featured in our monthly newsletter and blog! The Oakland Literacy Coalition newsletter provides members the opportunity to promote their free community events and job postings with colleagues and other leaders in Oakland and beyond. Information will be posted to our website blog within 48 hours and included in our monthly email round up, sent at the beginning of each month. • Free resources or events (no fundraisers or goods for sale). (Member Network organizations may place paid fundraisers). • Please include a short description with a brief summary explaining what it’s about and why it’s relevant to other members and colleagues in the field. • Please include a link to the event page or landing page. • Please submit no less than 3 weeks prior to your event date. Please use this form for announcements, jobs, and news.